Some people prefer round drinks coasters over the straight, square, hard line counterparts. 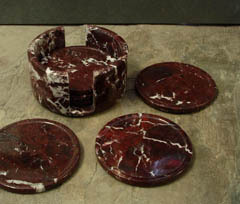 Below we have listed our entire collection of round natural stone coasters. A stunning vision of swirling colors, floating in hazy lines, like brush strokes from a masters pen, only the master is mother nature herself, and she has no rival. A beautiful example of the natural beauty that is available in natural american sandstone. Highly absorbent and backed with cork to protect your furnishings. Pictures emerge, written in streaks of deep brown and black shadow lightning, which sunders the subdued surface of the sandstone, remaking it in the image that was envisioned by nature, when the stone formed deep beneath the surface of the earth. Hazy visions of a perfect sunset, coming to us out of the misted void, to alight gently on our minds eye, and whisper secrets of visionary hues, which surround the natural surface of these stunning sandstone beverage coasters. 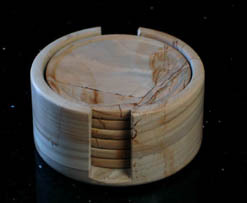 The perfection of subtlety, these natural sandstone coasters have a stark, and unassuming face, which is broken by a million minute, tiny points of textured contrast which give depth and personality to what is otherwise a basic blank in the sandstone world. The intrinsic beauty of multicolored green marble, with its deep tones, and arched white lightning features has been captured here in a still image. 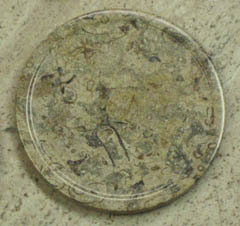 The image has then been printed onto the surface of a set of highly absorbent sandstone beverage coasters. 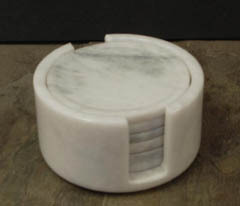 The result is a series of coasters which has both the beauty of marble, the feel of natural stone, and the absorbency of real mountain born American sandstone. A beautiful winodw looks out on an ancient world, a world of stone and iron, where beauty is carved into the very rock of the earth itself. Yet this window is not made of glass, it too is a piece of stone, a never changing disc carved from the very earth istelf. Highly absorbent, honed smooth, and then imprinted with a stunning image of stone art, these coasters are an impressive set for any environment. The utility of these highly absorbent sandstone beverage coasters is in no way hampered by the fact that a stunning, deep, and rich portrait of an adore able little tree frog has been printed onto the surface face of the stone. As the frog looks around, he readies himself to leap, his moment of decision caught forever in the stone of time. A thousand cat eyes are staring at you, asking you, demanding of you... are you using a drink coaster? Don't disappoint the felines, they know how to get their revenge. 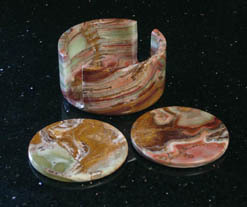 These coasters are made from highly absorbent sandstone and are produced in the United States. The perfect compliment to the gently textured surface of a sandstone beverage coaster, is a scene from a sunny beach day, with sea shells tossed abroad and across the surface, at random intervals. Over all, a light haze hangs, as if to simulate the misting waters of a breaking wave. The best way to describe the stunning beauty of our multicolored onyx stone drink coasters is to simply instruct you to take a look at the pictures. There are no words that can adequately describe the complex array of colors, the million hued march which make sits way across the glistening shining surface of these elegant and sophisticated pieces. Million year old natural marble decor. Locked within the surface of each and every coaster, is the dendrite imprint of a real, ancient creature, a living being that strode the bounds of the earth a million years before your grandparents were born. This is a chance to own a piece of the great wide history of the earths geological past, and in a way to become part of that unbroken chain yourself. Teak marble drink coasters are gentle, subdued, tan brown coasters, that suddenly get exciting, when you notice the deeply contrasted streaks of brown haze, which breaks the stolid surface of the pieces, and makes for a unique and one of a kind pattern, in each and every piece. Clouds of hazy mist pass through one another, leaving trailing tendrils of smoky spirit to linger in the arms of one another, forming a soft airy surface, which is trapped forever within the polished glistening face of these refined and sophisticated home decor accessories. Crimson and maroon tones battle in an endless war, seeking supremacy over the polished surface of each beverage coaster. However, the battle is broken, ripped asunder, by the brilliant white bright flash of light which ignites the air with power and fury unmatched by any but the most contrasting lights of dawn. Are you ready to explore new lands, discover new people, and new civilizations, and to strike out into the unknown and challenge the darkness beyond? Well then these are the coasters for you. Capturing the spirit of the age of conquest, this ancient map relief is a testament to the guiding hope of a people who were reaching out, blind, but strong, into the unknown, and conquering the night. When printing an image on natural stone, you have to be aware of the texture, the spirit, the very nature of the stone itself. Having such a powerful, mountain born canvas, can actually affect the way the picture ends up being portrayed, both texturally, and in the living face of the stone itself. In this ancient relief of a palm tree standing in a forgotten dessert, we have an image that matches the sensibilities of its sandstone backing. Here we see a piece of natural, mountain born stone, decorated with a series of simple, primal, powerful images. Symbols, basic to the very nature of our minds, like the geometry of humanity printed in simple bold colors, matches the wild, natural, untamed spirit of the american sandstone. The result is a union of art and nature, with each reinforcing the personality of the other. The surface of these coasters is like looking at a symbolic portrait of ancient Greece. Not the war, not the philosophy, not the science of ancient Greece, but the spirit, the average, everyday life of the time, emblazoned in an eternal portrait, set into stone. With the potted plant we see life, with the border we see art, and in the faded picture we see time, all available in a set of functionally absorbent coasters. The Fleur De Lis is an ancient symbol, representing a flower sprouting from the earth. While it has most often been associated with the country of France, we actually have remains of ancient Egyptian and Babylonian art work which contains depictions of these same flowers. That means that the symbolism of this image stretches beyond culture, or borders, making it an intrinsic part of all of human history. The Beauty of Earth coasters are an eternal contradiction. The image itself is a stylized artistic rendition of the inside of a piece of quartz or agate, it is a human depiction of stone. This picture is then printed onto actual pieces of natural stone, the kind quarried directly from mountains in the American Southwest. The result is a coaster with a dual identity, which merges human vision with natural beauty for a startling effect. An ancient relic carved in stone, then captured in print and reproduced on another stone. There it becomes like an amulet, an ancient and mysterious pendant, a locket of mystery. Here we see the million points of amber beauty, swirling in a violent maelstrom of color and contrast. Watch as the beauty of this reproduced image is enhanced, by the textural details of the sandstone itself. All of this occurs in a set of coasters which are highly functional, due to the naturally absorbent property found in the sandstone itself.